Since the Company Started this Project On 2003 December 31s.Up-to We Completed 8 Projects this One is the 9th Project. In this Space Station we are using advanced technology that means in construction part and Eminities part Like Home Automation, Highlevel Security System, Mainly "SHEAR WALL" Technology. We are giving you World Class Facilities Like a Luxurious Living In Hyderabad. You Can access your Electronics from anywhere. "New Luxurious Individual Concept Flat With Best Aminities and Latest Construction Technology"
We are Providing a Newly Constructed Luxurious Duplex Independent Flat in the Heart Of Hyderabad. We are providing Luxurious life In Hyderabad City With all Advanced Technology. WE ARE PROVIDING YOU THE GOOD AND LATEST ADVANCED TECHNOLOGY FEATURES LUXURIOUS LIFE. Address: TELLAPUR, Gachibowli, Hyderabad, Telangana, India. 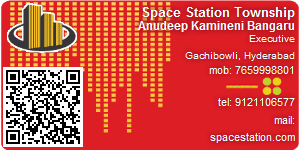 This Builder Profile page for "Space Station Township" has been created by PropertyWala.com. "Space Station Township" is not endorsed by or affiliated with PropertyWala.com. For questions regarding Builder Profiles on PropertyWala.com please contact us.